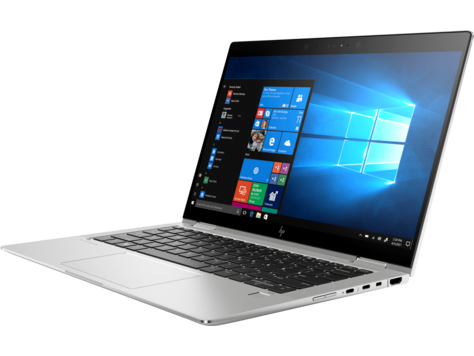 Model: The HP EliteBook x360 1030 G3 is the company’s new flagship 13.3-inch convertible that packs virtually all premium technologies that HP has to offer and brings together performance and compactness. HP updated the EliteBook x360 business-class convertible notebook, which features smaller bezels for a more compact design, a CNC unibody aluminum chassis, and an option for a much brighter display. The laptop measures about 30,48 x 20,57 x 1,52 cm (12 x 8.1 x 0.6 inch) and weighs about 1,37 kg (2.8 pounds). While that makes the new model about the same weight as its predecessor, it has an overall smaller footprint thanks to side bezels that are half the size of the 2nd-gen model. The computer has a 360-degree hinge that allows a user to use it in the notebook, tablet, tent, or stand modes. And it also supports a digital pen which attaches to the side of the notebook magnetically. HP has once again sourced Chi Mei for the sharp Gorilla Glass 4-protected 1080p touchscreen on the EliteBook x360 1030 G3. It is a 13.3" FHD (1920x1080) Touchscreen Sure View Privacy display panel. The bright backlight, in particular, is a significant improvement over the relatively dim and less accurate display of the older EliteBook x360 1030 G2. However, such a bright screen will inevitably affect the battery life of the machine. Color space covers the entirety of the sRGB standard and 62 percent of AdobeRGB. Results are comparable to the latest flagship Ultrabooks like the XPS 13, Blade Stealth, or Spectre 13. Other features include 4 B&O certified speakers, a 1080p camera with IR camera support for facial recognition, a multi-array microphone setup, and a spill-resistant backlit keyboard. In addition, the convertible has a Full HD webcam with IR sensors for Windows Hello facial recognition. The notebook has a 56.2 Wh battery, and HP says a user can charge both the laptop and its digital pen using a USB Type-C adapter. Speaking of the pen, it offers proximity alerts, letting a user know if he has walked too far away from the pen so that he doesn’t accidentally leave it in a room when he leaves it. Another strong selling point of the EliteBook x360 1030 G3 is connectivity. The new convertibles are equipped with Intel’s dual-band Wireless-AC 8265 module supporting 802.11ac Wi-Fi and Bluetooth 4.2, a 4G/LTE modem with or without GPS, as well as NXP’s NPC300 I2C NCI NFC controller. The notebook features two Thunderbolt 3/USB Type-C ports, a USB 3.1 Type-A port, HDMI and headset jacks, and a nano-SIM card slot on models with integrated 4G LTE support. Since the EliteBook x360 1030 G3 can work in both laptop and tablet modes, it naturally also features an accelerometer, a gyroscope, a magnetometer, and a Hall effect sensor. 84.87%: This rating should be considered to be average. This is because the proportion of notebooks which have a higher rating is approximately equal to the proportion which have a lower rating.